Bolton boss Sam Allardyce said he is considering sending El-Hadji Diouf to a sports psychologist to stop his persistent spitting. Bolton fined Diouf for spitting at Arjan de Zeeuw against Portsmouth on Saturday, the third time he has been involved in such a controversy. "We need to cover all angles," Allardyce told BBC Five Live. "The most important thing for us is to have El-Hadji playing to his full potential and for his own future." 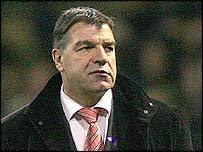 Professional Footballers' Association chairman Gordon Taylor backed Allardyce's approach. "It's very strange that he's not learnt the lesson," Taylor told BBC Five Live. "I'm pleased the club is to have words and get professional counselling to understand why he does this." Cleveland police also launched an investigation earlier in November after Diouf was accused of spitting at a Middlesbrough fan. Bolton have docked Diouf two weeks' wages for the De Zeeuw incident, and Taylor said he expected the Football Association to bring a charge against the Senegal international. "It's certainly not acceptable. People should be aware that we have a disciplinary system within football both at club level and at football association level," he said. "I believe the lad has apologised and also been fined. It's highly likely he'll be charged as well by the FA."